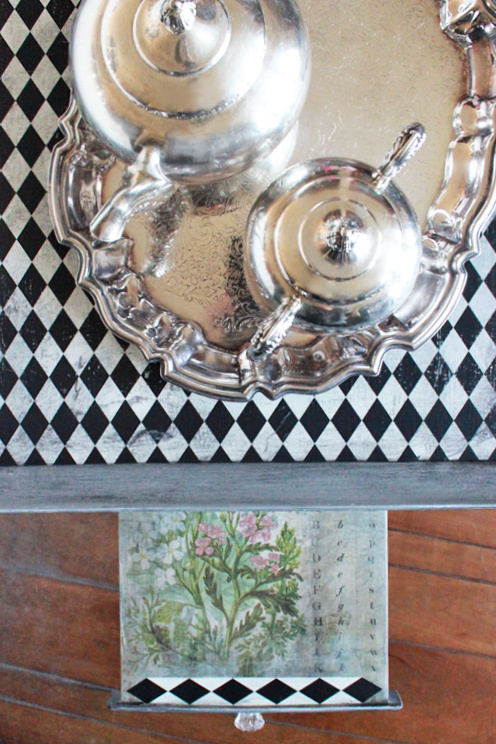 This Mad Hatter Tea Table project is whimsical and a wee bit zany! 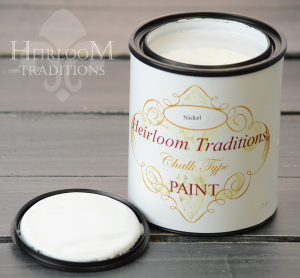 The creative team at Heirloom Traditions Paint has sponsored this post, because yep, they’re awesome! If you’d like to follow me down this rabbit hole, you’re gonna need some stuff! 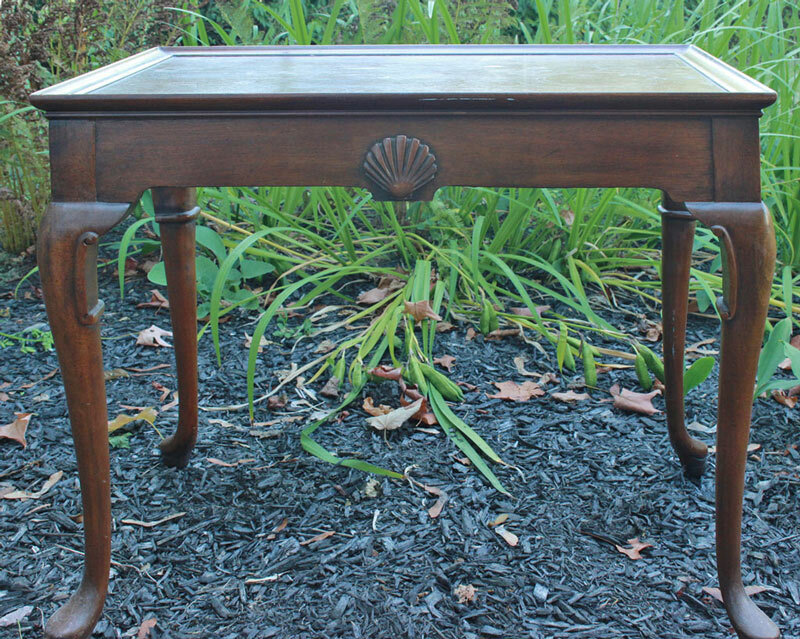 When she came to me, this charming little tea table had good lines, functional pull-out trays and lovely scallop medallions – but the tabletop had been badly abused. The veneer had bubbled and was quite marred. Goodness knows what she’s been through! I felt an instant affinity for her. Something about her feminine lines, coupled with signs of active use seemed, well, familiar. After a quick but strenuous session with a hot iron, some parchment paper and an electric sander, the damage had been brought under control. 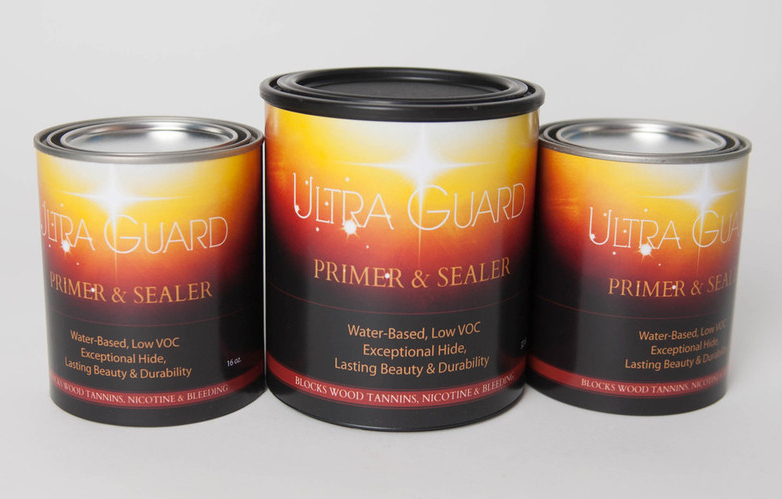 A quick coat of Ultra Guard was in order, to seal in the tannins and stain prior to painting. That’s better…a creamy foundation makes our makeover so much smoother! 2. 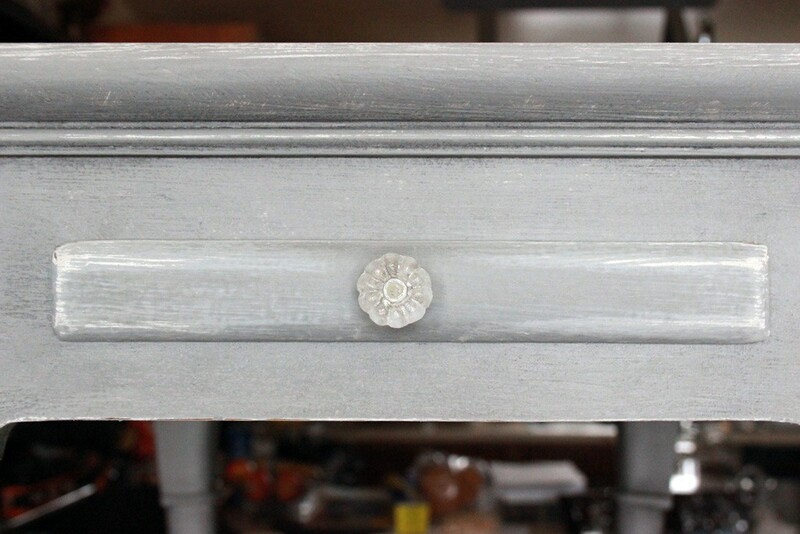 Once the primer has dried (about an hour) a single coat of Heirloom Traditions Rainy Day Chalk Type Paint creates an excellent basis for our whimsical finish. 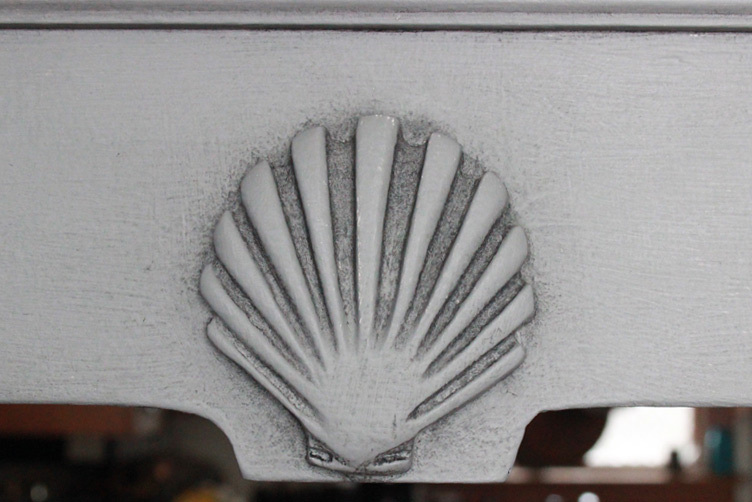 Note: for best results, allow the paint to cure overnight prior to applying waxes and distressing. 3. 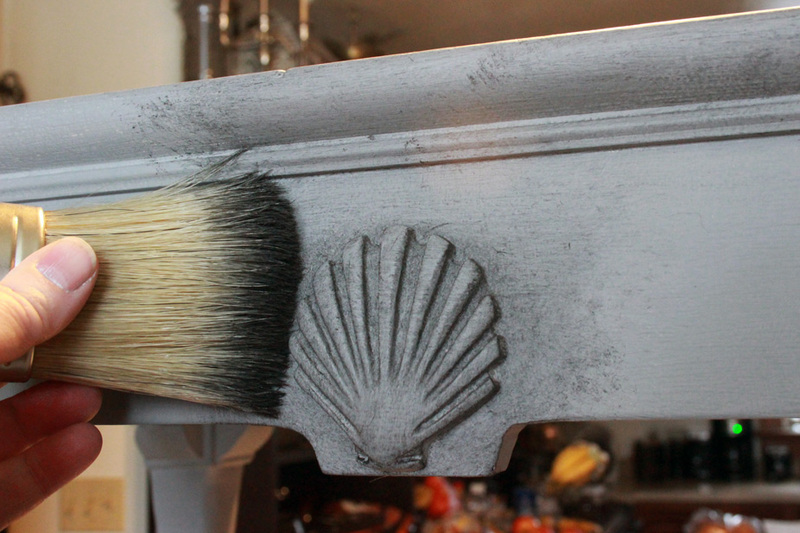 The first layer of Clear Soft Wax is applied to the entire surface with a Best Chalk Brush. 4. 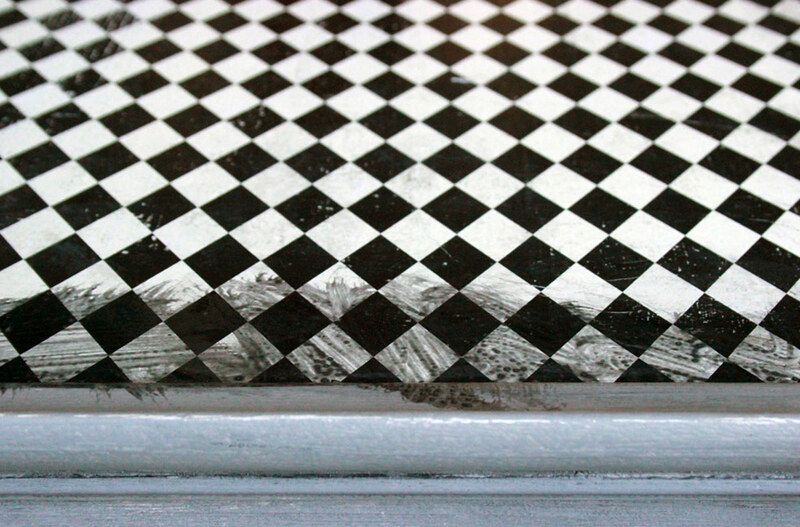 Use clean lint-free rags to wipe back the Clear Soft Wax. 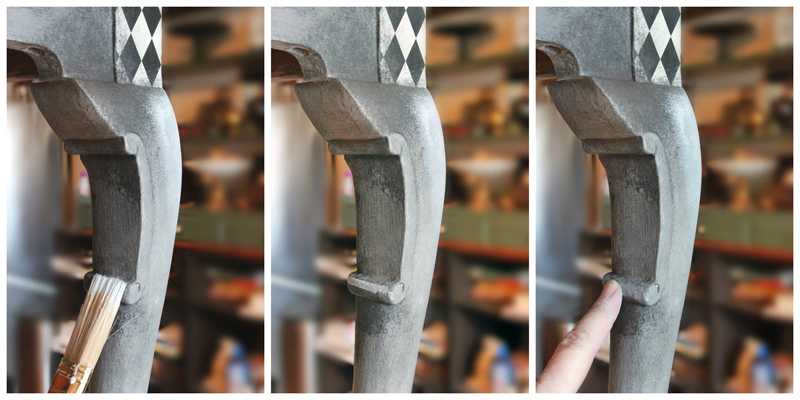 Note: If you use Spray Wax, no wiping back is required! 5. 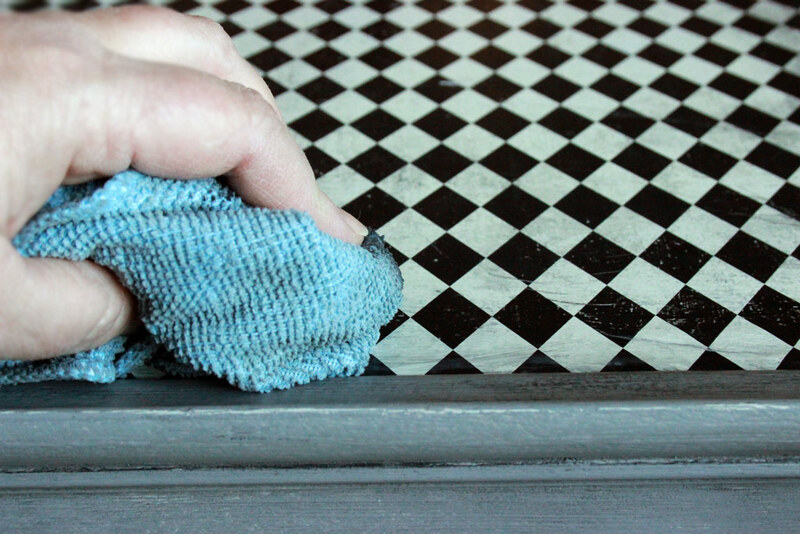 Next, a layer of Jet Black Soft Wax is applied to all the nooks and crannies. 7. Now it’s time to embellish! 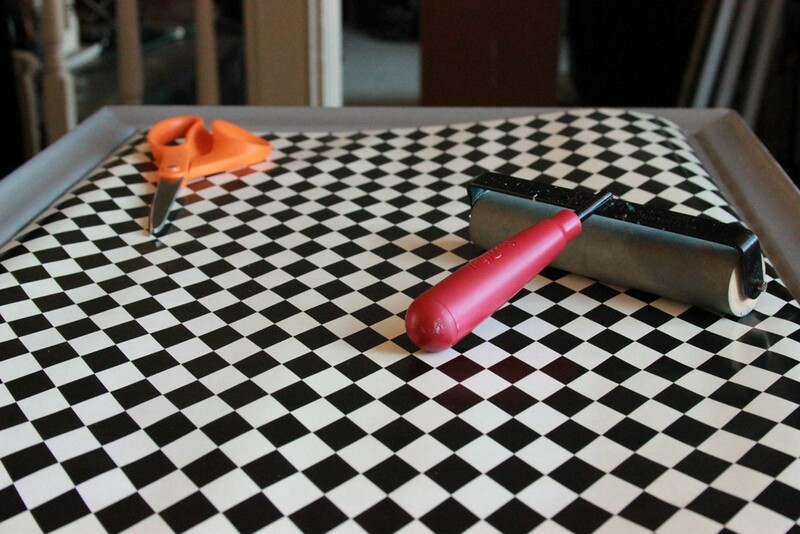 Cut a piece of patterned paper large enough to cover your tabletop. 8. 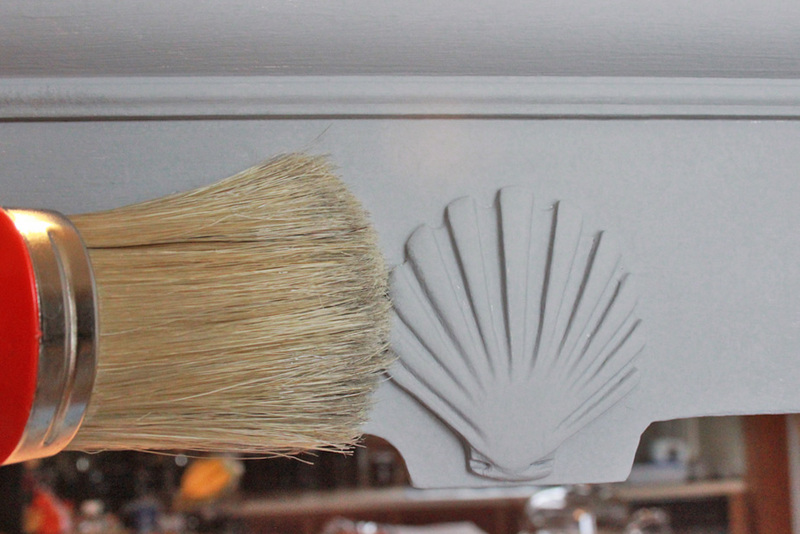 Apply a generous coat of 1Gel to the surface of the wood, and carefully adhere the paper. A brayer really helps to get any wrinkles and/or bubbles out. Note: A spicy vocabulary can facilitate the process, as well. 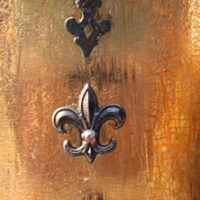 The 1Gel dries very quickly – I was able to begin distressing the surface of the paper within the hour. 11. Then wiped back with damp absorbent toweling, leaving a soft layer of shadowing ‘round the edges of the top. 12. Decoupage pretty scrapbook paper to the surface of the pull-out trays, using 1Gel. 13. 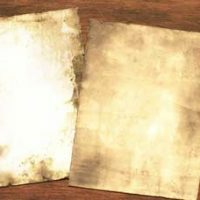 Sand the paper lightly when dry, to age. 14. 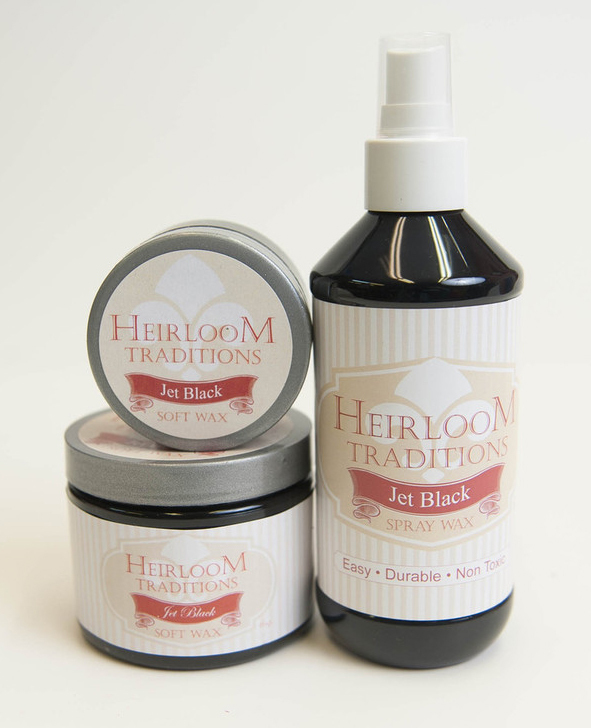 Add Jet Black Soft Wax to soften the transition at the edges. 15. When dry, coat with 1Gel to seal and protect. She had no knobs when she came to me, but Hobby Lobby had just the right thing. 18. 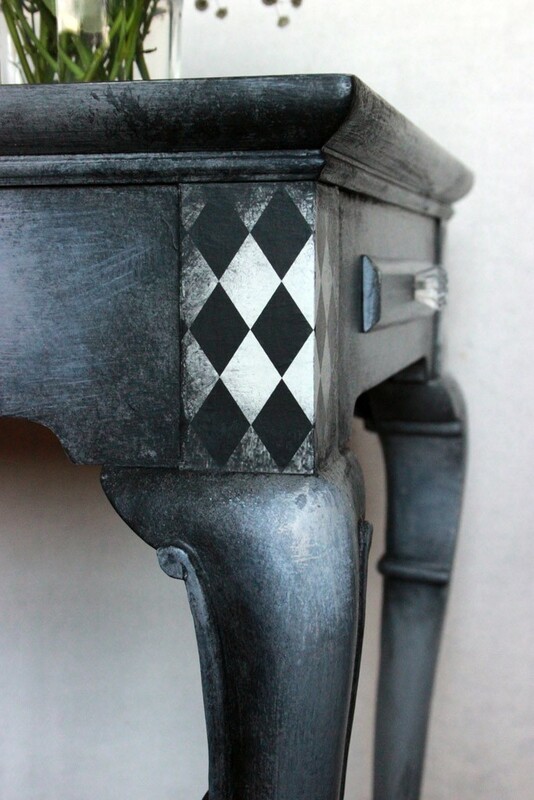 Add a casual ombre effect to the legs by simply painting the feet with thinned Black Bean Chalk Type Paint, and feathering your application upward. 19. Apply Black Bean full strength to just the feet when this layer had dried, leaving a gradually lightening effect from the base to mid-leg. 20. Stipple Black Bean anywhere you wish to create the impression of shadow. 21. 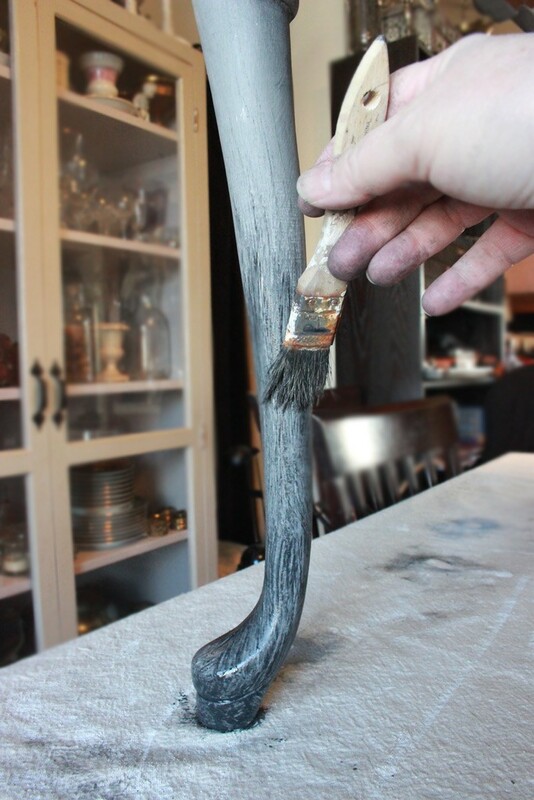 Keep a moist rag handy, and alternate between painting pigment on, and wiping it back to get a feathered effect. 22. For this admittedly over-the-top look, keep working the areas of shadow and light until an almost cartoon effect takes shape. 24. Retouch the areas you want to emphasize with a lighter shade. 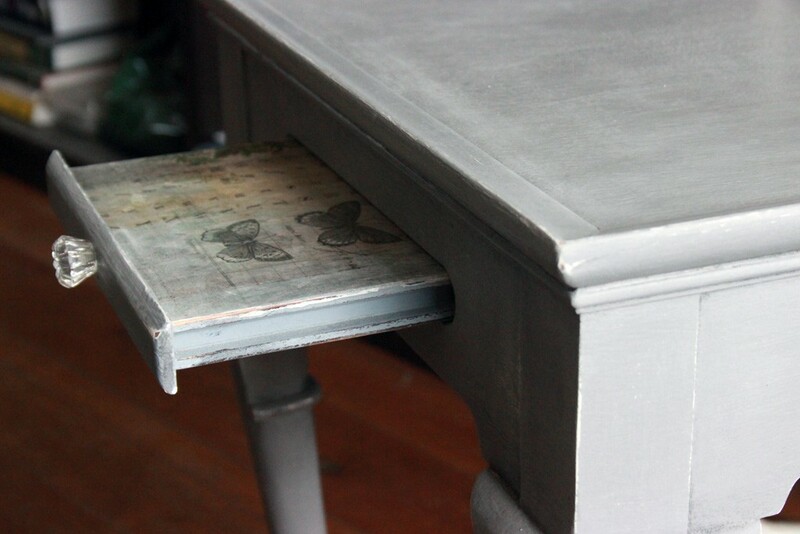 Here, Heirloom Traditions Nickel Chalk Type Paint has been used to gently highlight areas of interest. 26. 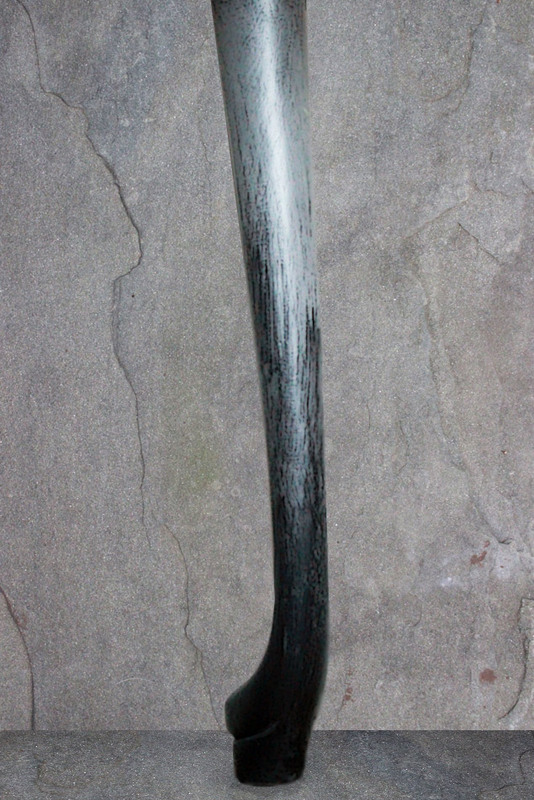 Once the paint has thoroughly cured, apply Jet Black Wax over the darkened areas and buff to a sheen. 27. 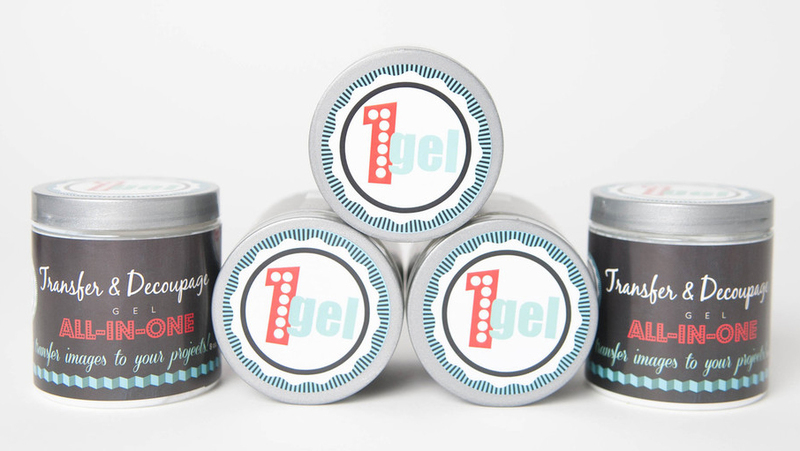 Finally, apply a coat of 1Gel over the entire piece to seal and protect. It dries so quickly, you’ll be sipping your well-earned cuppa within the hour! Thank you for visiting The Graphics Fairy today! Hope you’ve enjoyed this little excursion into zaniness. 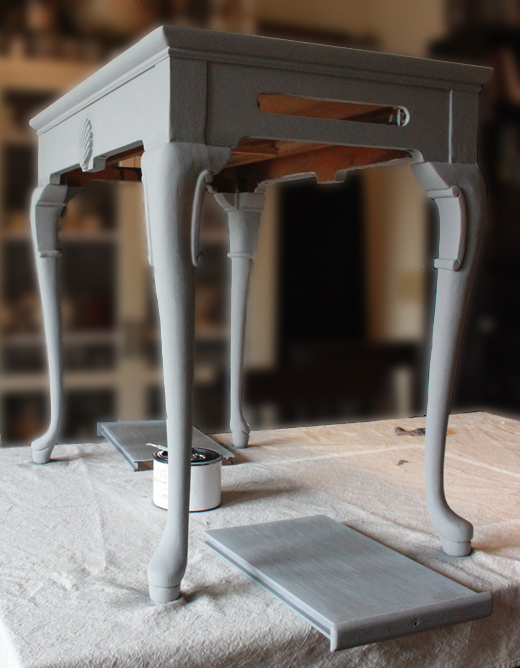 It was such a fun process creating this Mad Hatter Tea Table…I can’t wait to add humor and whimsy to another furniture project! 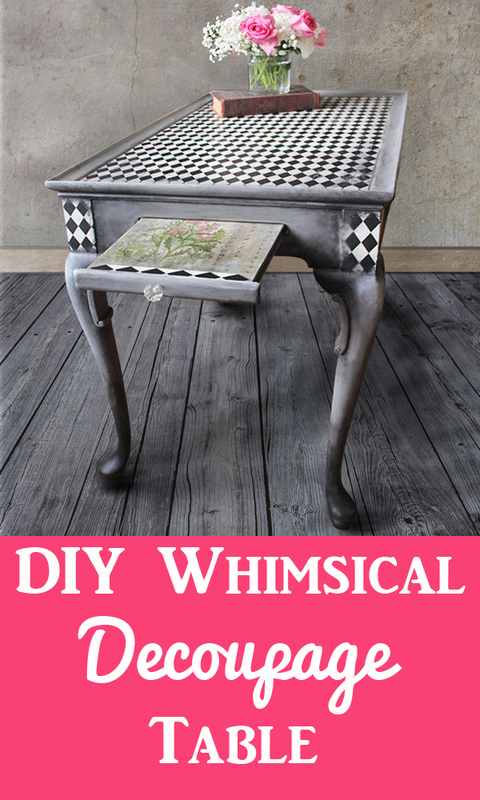 Break out your own favorite papers and experiment with playfully embellishing your next reclaimed piece of furniture: it’s sure to make you smile. If you appreciate a bit of nonsense from time-to-time, stop by Thicketworks to see what all the mayhem is about! This is fabulous! The Mad Hatter would definitely approve! Hi Christina, I have to admit that my husband is one who spied this lovely paper (he actually took me to Hobby Lobby on date night! – I know. I’m the LUCKIEST) It’s made by Bag o Chips, but I couldn’t find it online :(. Good quality paper – just right for this technique. Thanks for your kind words, and I hope you give this type of thing a try…it just makes you happy to do! Heather this table is absolutely gorgeous!!!! I am a huge Alice In Wonderland geek….and the title alone made me “curiouser”!!!! Well, fancy that! Look who’s here! Thanks so much, Tracey – your kind words mean the world to me. 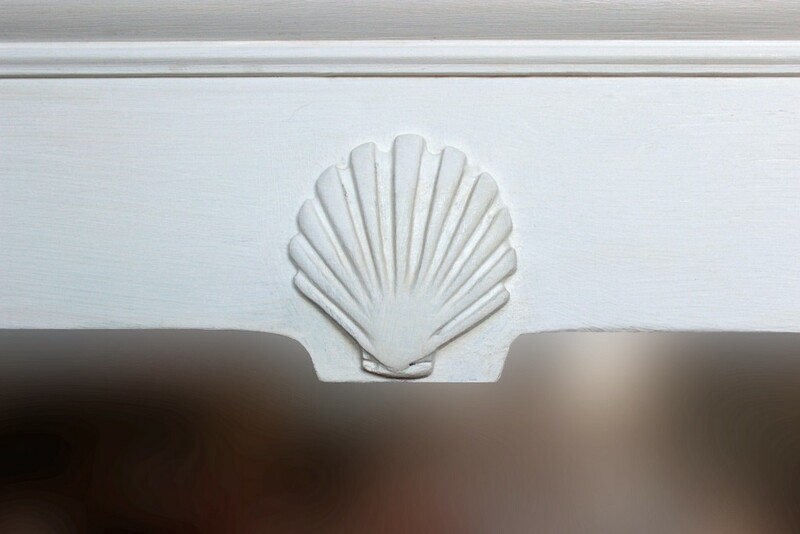 Love the gorgeous royal treatment you gave to the French Beds on your amazing blog: Tracey’s Fancy is the bomb. Thanks, Kathy – this one was a joy to do! Hi Debi – thank you! I’m honored you’d like to share. Have an awesome day! Seriously? This is amazeballs – would you mind if I shared with an art class that I am taking with Jane Davenport – (the theme is Alice of course)? Hey Sue! Your comment made me giggle…of course you can share it! The more the merrier..I’ll bet that class is AMAZING! Thanks for stopping by The Graphics Fairy! Hi Barbara! That’s fantastic! I wish we could see your Princess and the Pea room – what a delightful idea. It really is quite do-able, and I hope you give it a try. Thanks so much for leaving such a lovely comment. Hi Patricia! Yay! I’m so excited that you have one of these, and are feeling inspired. 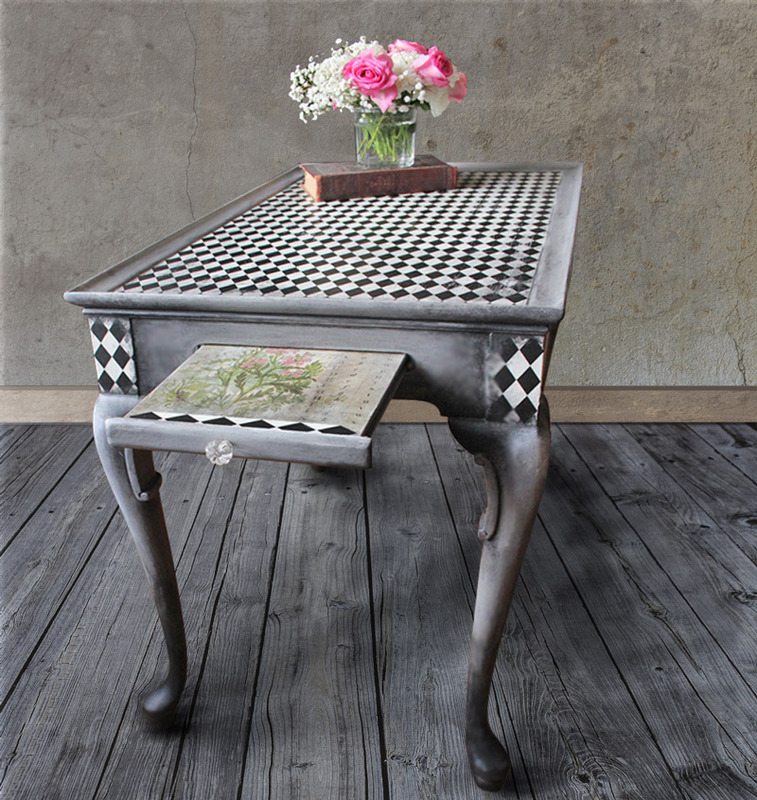 I think that tea tables are just lovely, but too dated for most decor these days. A bit of paint, some fun paper, and you’ll have a charming conversation piece. Thanks for taking time to join the conversation today! What a wonderful job you did! Thank you for sharing. Thanks, Peg! It’s a fun technique, and easy to do. Oh my goodness! 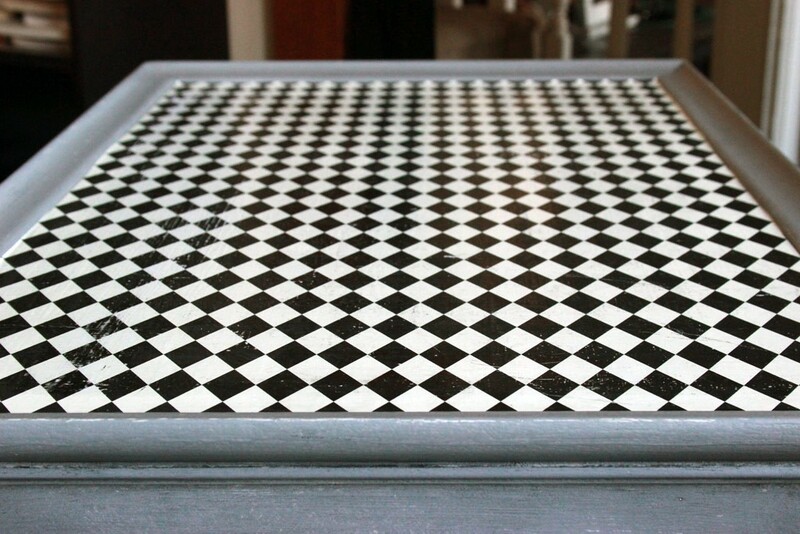 This table is WONDERFUL! I currently live in Germany so I’m not sure how available the paints and finishes are here. But I’m going to see if it’s possible to find them somehow. 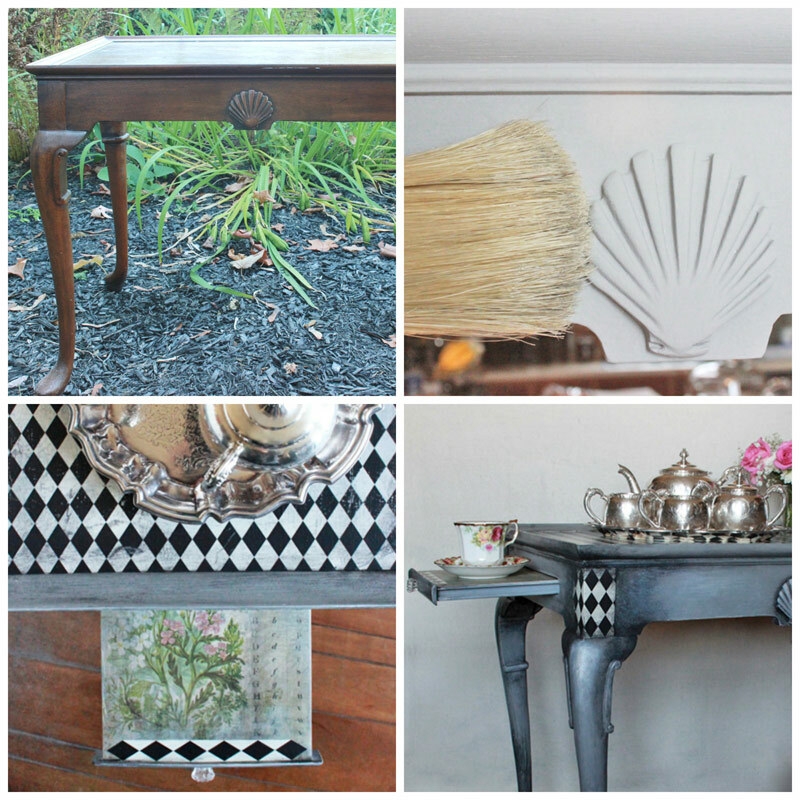 I’m always on the prowl at flea markets for small tables or trays. Or heck anything that just strikes my fancy. 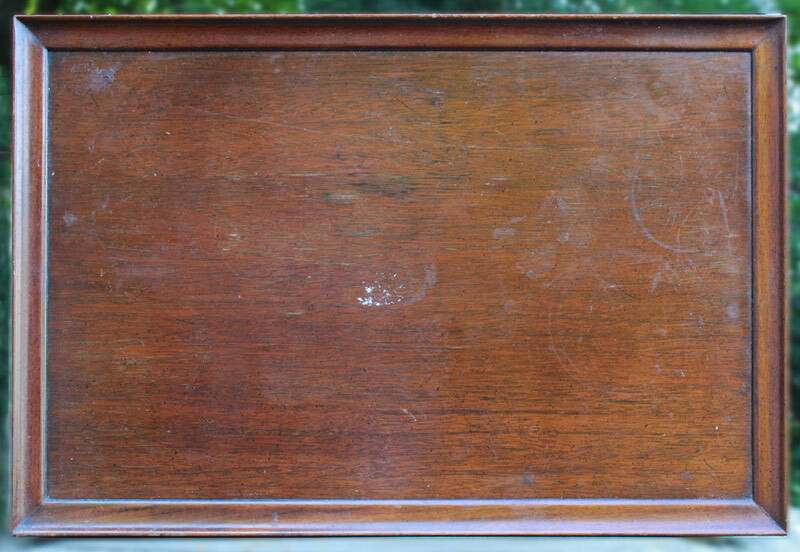 I picked up a old wooden typing table with the pullout tray that I picked up for 5 Euros. This technique would be perfect on it! Now you’ve got my creative brain just buzzing! Hello Global Gal…it’s exciting to think about the amazing pieces you must run across in Germany! 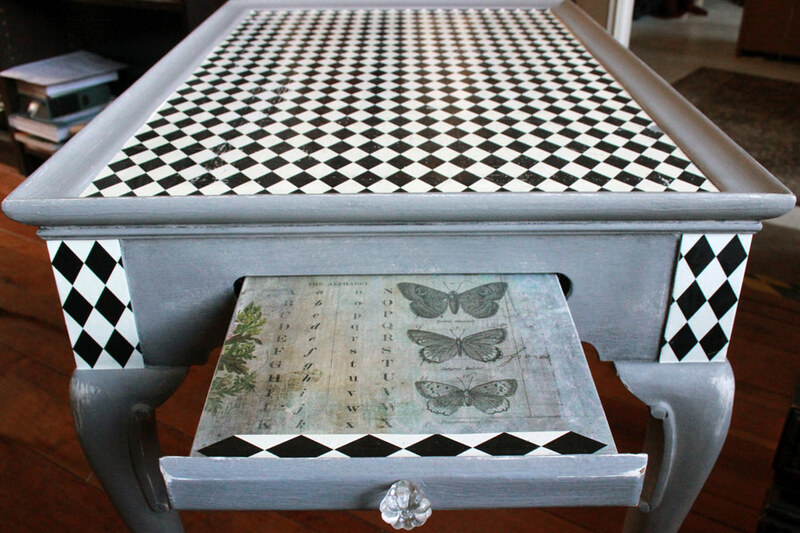 Love the sound of your typing table – it would be a perfect candidate for this treatment. Keep your eye out for papers in unlikely places, you never know when you’ll find a lovely patterned wall paper or wrapping paper languishing in a dusty corner of a shop. 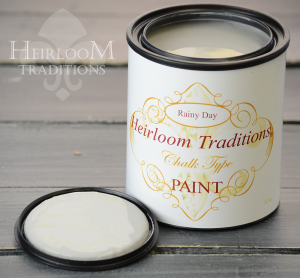 If you don’t have access to Heirloom Traditions products, you can experiment with DIY Chalk paint recipes and regular decoupage mediums. The waxes may be a bit difficult to replicate, but experimenting is half the fun! Thanks so much for stopping by The Graphics Fairy and sharing your creative ideas! You are amazing what a beautiful piece of art. And you have a wicked sense of humor to go with it all, I LMHO at ” If only I could work this same magic on MY veneer” & ” Note: A spicy vocabulary can facilitate the process, as well. You did an awesome job bringing out the cartoon effect and the messy stippling with a ratty chip brush did give it that playful mood, I loved the way you used 2 completely different papers & truly brought it all together. 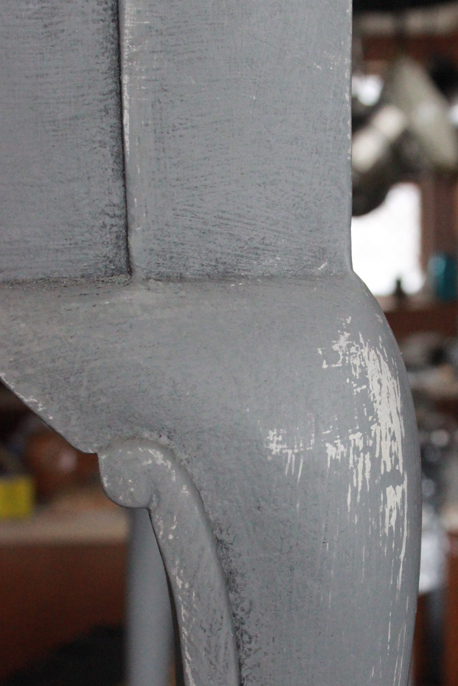 The haphazardly applied thinned paint was put on perfectly IMHO. I truly think you did an awesome job on this piece,. 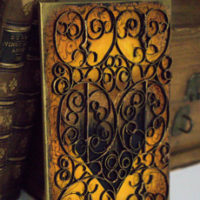 I would be proud to have it in my home. I LOVE IT! Thank you so much for sharing your talent with not only painting but also making this tutorial a pleasurable and fun read. You style will make this tutorial stick in my mind more than most other due to your style of presenting the steps. I look forward to more of your tutorial. YOU GO GIRL!! Hey Suz! Wow…now this is the kind of comment that makes a girl blush and glow with happiness simultaneously! Woo hoo! I had so much fun with this project, and I just had to share the feeling of mischievous enjoyment it gave me. It’s a pleasure to hear that the mood came through! I look forward to many more mischievous projects – it’s my nature, what can I say? Thanks for making my day – hope yours is AWESOME! Internet works in mysterious ways 🙂 I was cleaning up browser history and this link was in there from months ago – but I KNOW I’d remember this awesome table. First, I’m jealous of a table with pullout because that is perfect for a cup of tea! But the redo was incredible – I love Alice in Wonderland furniture but most is pretty garish – the shading you did is outstanding. Thanks for sharing all the details.